Little brown birds, sometimes referred to as little brown jobs or LBJs for short, can be confusing. One such group are pipits. 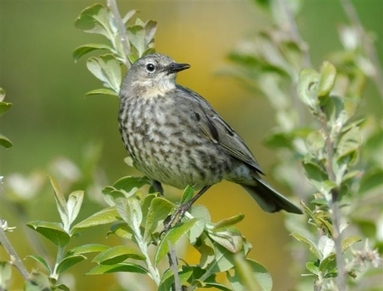 There are three types on the Arran list - the Meadow Pipit found in meadows, the Tree Pipit found in trees and the Rock Pipit found on rocks. Oh that it was as easy as that…but it is not. However here are some handy hints to begin to assist you to sort out these three pipits with helpful photographs from Brian Couper, Arthur Duncan and Robert Lambie. Rock Pipit on Arran is a breeding resident, widespread along the coast with additional birds passing through on migration and over-wintering. It is a dark greyish looking bird with dark legs. 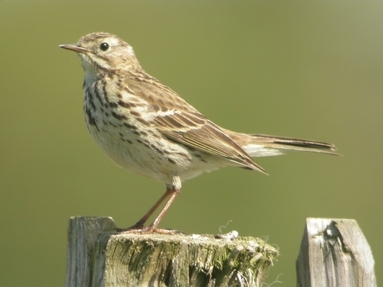 Meadow Pipit on Arran is also a breeding resident widespread on upland moors but also on the coast particularly during migration and over-wintering. It is an olive brown looking bird with pale orange legs often with a clump of streaks in the middle of the chest. 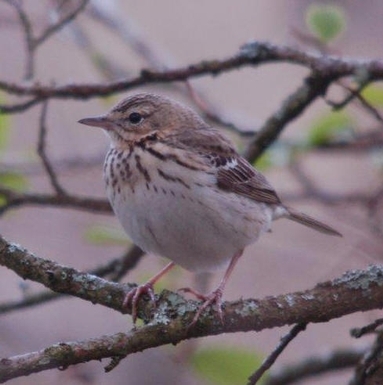 Tree Pipit on Arran is a summer visitor with a very distinct song with canary like trills. They seem to enjoy woodland edges. It also is an olive brown bird with pale yellowish flanks and buff yellow underside. The legs also are pale. Now go out and with the help of a good bird book and a pair of binoculars practice your identification skills on a pipit near you. Two warnings: each species plumage is variable and there are eight other pipits on the British list …but this is enough to be going on with.